There is something for everyone at Resorts World Sentosa Adventure Cove Waterpark – for the adventurous, there are roller coaster-like rides (with almost 90 degree drops) and for those who just like to chill out, there is a long Adventure River where you can relax on a tube and let the currents carry you around the Adventure Cove Waterpark along the river. However, as with any other fun theme parks, you can expect long queues at all the fun and exciting rides especially over the weekends and school holidays where you can queue hours just to take a ride at the Riptide Rocket (the water rollercoaster)! And if you want to skip lines at Adventure Cove Waterpark and get discounted tickets up to 50% off, check out Klook! 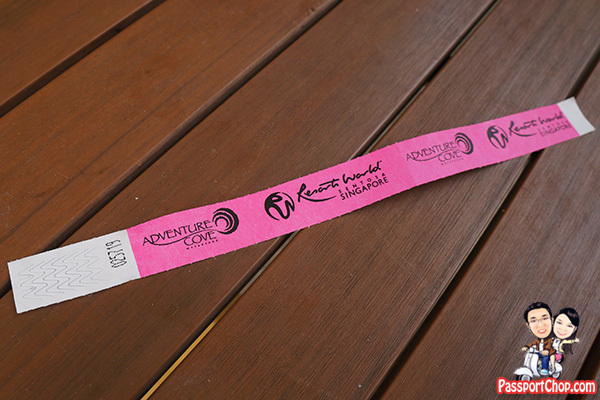 They offer exclusive insider deals from skip-the-line passes and ticket collection is hassle-free. You will receive your e-ticket(s) instantly after you book with Klook. All you have to do is to show the e-ticket(s) at the entrance and you will be admitted straight away. PassportChop.com visited the RWS Adventure Cove Waterpark on a Sunday morning during the June school holidays and we somehow managed to check out the top 7 Adventure Cove Waterpark attractions: Whirlpool Washout, Spiral Washout, Riptide Rocket, Dueling Racer, Pipeline Plunge, Tidal Twister and Rainbow Reef all within 2 hours and queuing less than 10 minutes at each attraction! 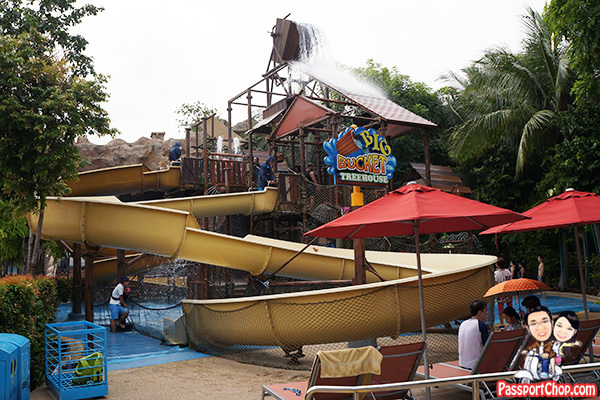 Read on as we share 6 tips on how to beat the queues at Adventure Cove Waterpark. 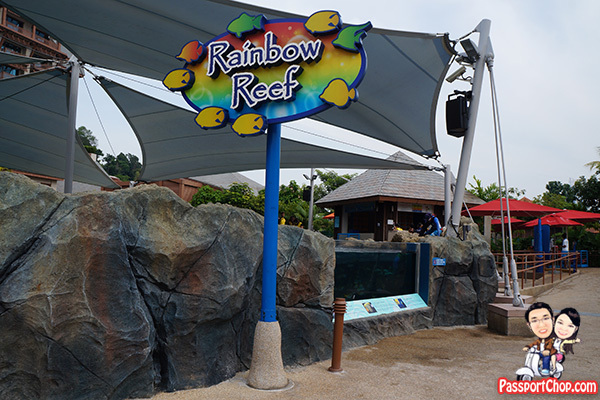 This is not our first time at the Resorts World Sentosa Marine Life Park – if you are interested, you can also check out our Dolphin Interaction experience at Dolphin Island (located within the Adventure Cove Waterpark). Do note this first tip might not be applicable to families with children as most of these 7 rides/attractions have a minimum height requirement of 122cm. But if you are visiting the Adventure Cove Waterpark with a group of adult friends, then yes – this tip applies to you. 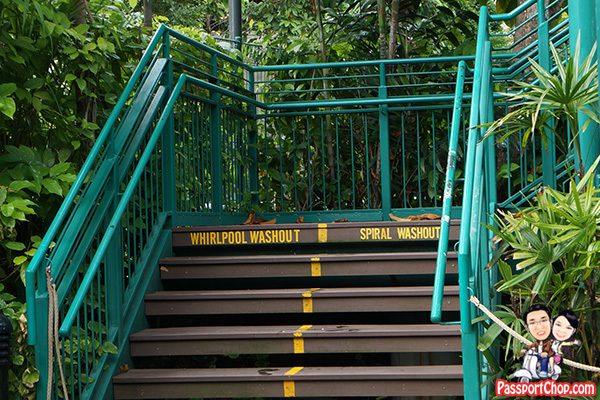 Once you get into the Adventure Cove Waterpark, skip the Adventure River and proceed direct to Whirlpool Washout and Spiral Washout (labelled as 3 and 4 in the map below – click to enlarge). Both these rides are located at the same platform – you just slide down different tubes (each of the tube is structurally different). You will collect your float from the ground floor and walk up a series of steps to the platform from where you will slide down in your float. 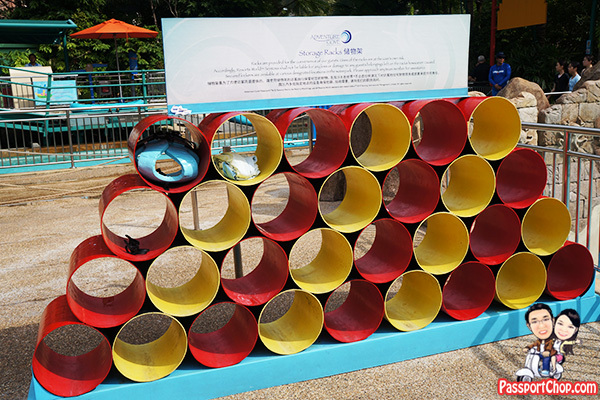 Both rides are over in seconds – the concept is similar: at first you will slide down a covered tube (you won’t be able to see anything) then suddenly brightness as you emerge out of the covered tube into the mid-section of the tube and depending on which ride you took, you will either be spinning around a whirlpool or just go through a series of twists or turns before sliding down another covered tunnel (more darkness) and finally emerging through the tube to your destination where you started! The picture is of the Whirlpool Washout – I floated around a few times and I was wondering if I will ever be washed down the whirlpool into the seemingly narrow tube in the middle! The picture shows the Spiral Washout where you go through a few twists, turns and dips before spilling out into an open cool splash pool. 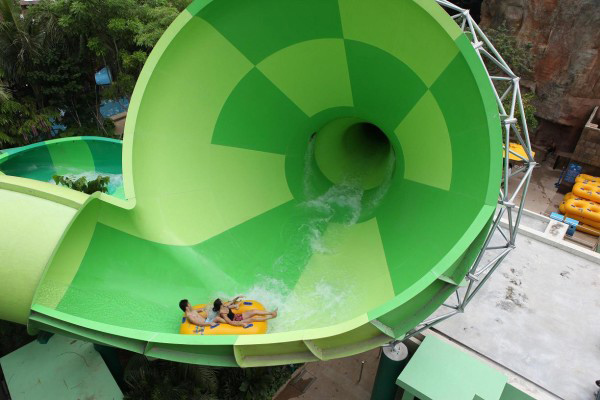 Not for the faint-hearted as you slide down the tubes quite quickly! But it is a lot of fun! Do note that you are not allowed to carry anything on this ride and the other 6 rides e.g. cameras and bags. 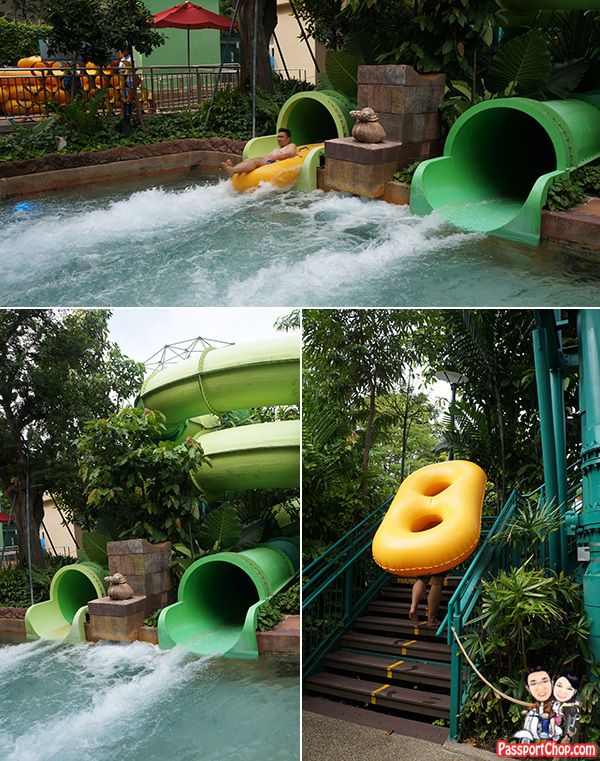 Riptide Rocket features Southeast Asia’s first hydro-magnetic water coaster. 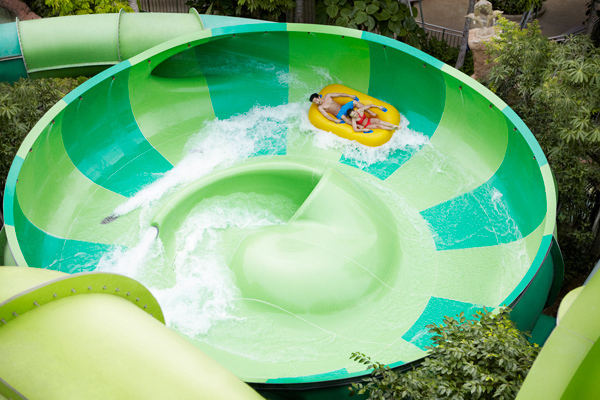 Unlike other water rides, this ride doesn’t just go down. On the ride, you will experience climbs, drops, twists and turns. 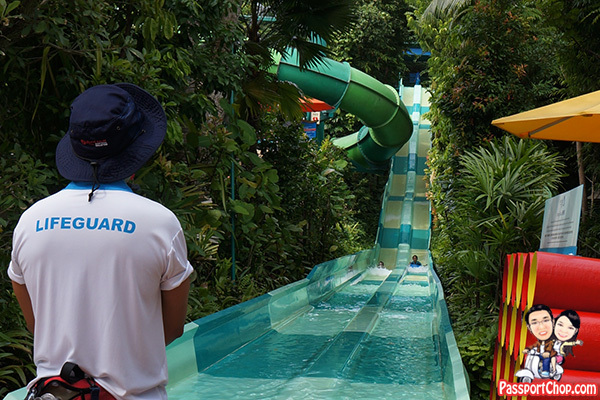 This is the most scary ride in Adventure Cove Waterpark (ACW) – if you want to experience what a roller coaster on water is like, Riptide Rocket is the ride to take! Just hang on tight! This is what the Riptide Rocket, Southeast Asia’s first hydro-magnetic coaster, looks like from the top – do note that you are seeing a portion of the Riptide Rocket – there are some very scary drops that are not quite obvious from the picture below. It’s like riding a water tornado in the dark! Experience dropping through an elevated chute that sends you careening down banked turns, radical twists, dips, unpredictable passage of swirls and slalom before splashing out in a pool of water. Hang on tight as the ride can get quite fast. Both Pipeline Plunge and Tidal Twister drops from the same platform – you will have to carry the floats up a series of steps too! 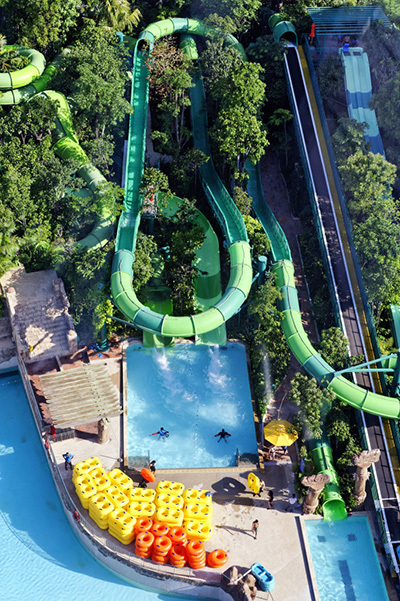 The Pipeline Plunge and Tidal Twister is located just beside the Riptide Rocket – but go for the Riptide Rocket first as that is the most popular ride here at Adventure Cove Waterpark and you can expect quite long waiting times. If you are feeling competitive, you can challenge your friend to the Dueling Racer – here your float is much lighter – a rubber racer mat. You will plunge head first down the slide and that’s what makes this Dueling Racer slide really scarier than the Whirlpool Washout – at least with the other rides, I am leaning back and enjoying the slide downwards – here I am facing forward experiencing directly the water and the rush of the air as I slide down! If you still want to compete more with your friends, head over to Splashworks (operates from 12 noon to 4pm daily) to take on an obstacle course involving a balance beam, a cargo net and a tight rope. 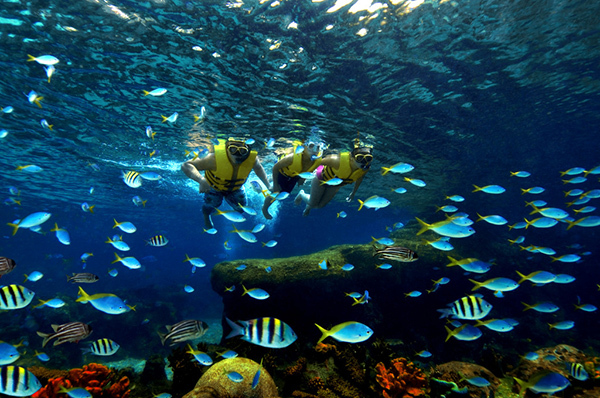 Once you are done with the above rides, head over to Rainbow Reef where you get to snorkel among 20,000 fishes – a must check out for snorkeling enthusiasts! You will be provided with snorkel gear and lifejackets and given some quick instructions and then you are good to go. You will snorkel one round around the Rainbow Reef. Do note that the pool is actually quite deep and the floor is filled with real coral reefs so it can be quite sharp. There will be lifeguards around so let them know if you need any help – first time snorkellers might face some challenges adapting to breathing through the mouth and not through the nose. Rainbow Reef is absolutely beautiful with lots of fishes swimming around colorful coral reefs – it actually looks like the picture below (maybe a tad less brighter) when you look down at the fishes and coral reefs! As mentioned above, the same platform hosts 2 rides – the Whirlpool Washout and Spiral Washout – the queues are clearly demarcated on the steps but when it gets really crowded – the queues get muddled up. Be observant on how the queues are formed – not a lot of people are aware that there are 2 separate queues – just go straight to the queue of the ride you want to take. You might get some stares and grumbling from the crowd but you are doing the right thing by queuing in the right way. Another attraction/ride that has a similar queue system is the Pipeline Plunge and Tidal Twister – so look out for the same thing. 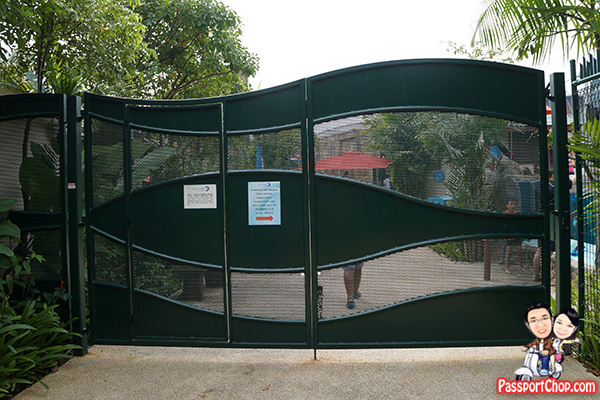 If you are doing a staycation at Equarius Hotel and is planning to check out Adventure Cove Waterpark, then you are in luck as Equarius Hotel guests get to enter the Adventure Cove Waterpark through the ACW backgate! There is no early admission though – you will also enter the Waterpark at its opening time at 10am but you will enter from the least crowded part of the Waterpark – go straight to Riptide Rocket; skip the Rainbow Reef (the first ACW attraction you see) and go straight into the park. To enjoy this privilege as a guest of Equarius Hotel, just inform the hotel lobby staff that you have Adventure Cove Waterpark and is a guest of Equarius Hotel (you will be required to report your room number and show your ACW entrance tickets that is valid for that day). At around 9.55am, the hotel staff will gather everyone (who is going to ACW) at the lobby and bring them to the backgate. You can also come back to the Equarius Hotel through the backgate when you are done having fun at Adventure Cove Waterpark. Another plus point about visiting Adventure Cove Waterpark as a guest of Equarius Hotel is that I can put all my valuables and stuff in my hotel room and just bua long long walk to the Waterpark in my swimwear. 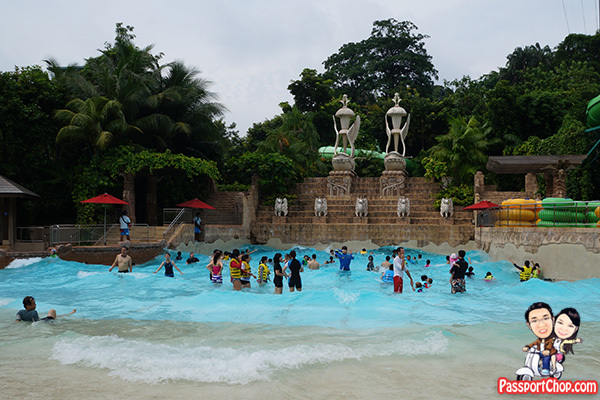 The Adventure Cove Waterpark charges quite a lot for a locker – there is a one-time locker fee which allows unlimited access during your entire day of visit. Lockers are available in Small (360mm high x 370mm wide x 500mm deep) and Large (910mm high x 370mm wide x 500mm deep) sizes. Costs of the lockers for daily rentals are $10 (Small) and $20 (Large) during park operating hours. You can also store your stuff in the storage racks available at each rides but as you can see in the picture below, it is not a very secure place to put your valuables. 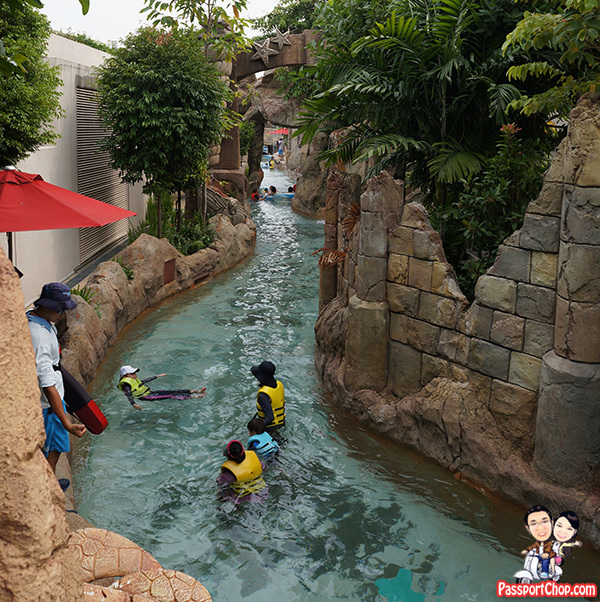 So once you have gotten the top 7 rides/attractions out of the day, you can explore the rest of the Adventure Cove Waterpark at your leisure e.g. you can get wet and wild at the Big Bucket Treehouse! Share the rush of the giant bucket tipping over gallons of fun in an action-packed wonderland of interactive water plays. Look out for the big pour from the big bucket – everyone will be drenched here – that is the whole point of coming to Adventure Cove Waterpark! Catch a wave at Bluwater Bay where the surf’s always up! Every 10 minutes or so, there will be huge waves generated at Bluwater Bay for about 5 minutes – go right to the front to enjoy the powerful waves as it tries to push you back to shore. Very shiok experience. If you really just want to chill out especially after a long day at Adventure Cove Waterpark, just grab a float and float down a 620-metre long river called Adventure River. Here the river currents will bring you through 14 zones of a surreal world where mythical creatures are the norm. The ride will take about 20 minutes. But by late afternoon, there is usually a shortage of floats so you might have to resort to swimming (not quite deep enough) or walk along the river. 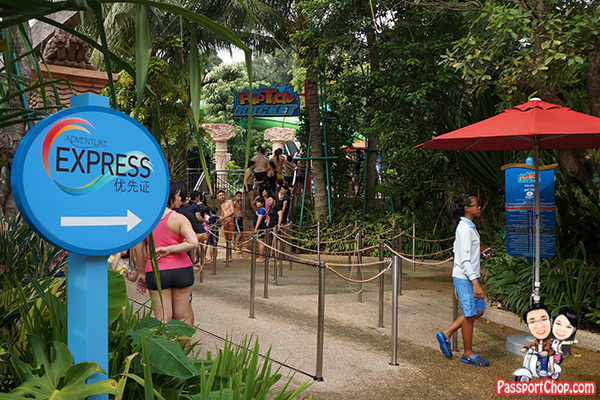 If you stick with my tip number 1, you don’t quite need an Adventure Express – a pass that allows pass-holders to go direct for the priority queue and skip the long normal queues. 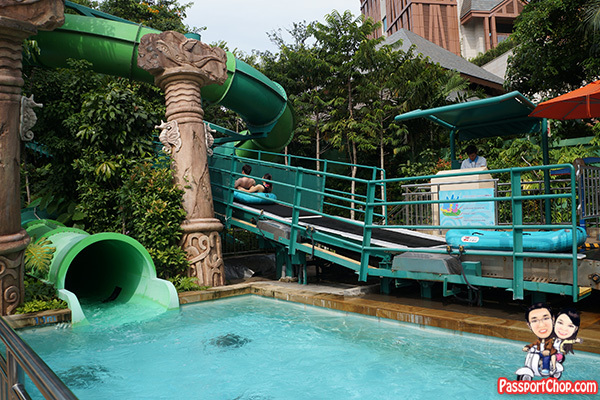 The Adventure Cove Waterpark Adventure Express is only valid for Rainbow Reef and Riptide Rocket only. It is valid for one (1) admission for each attraction. The Adventure Express pass can only be purchased onsite. Adventure Express charges are based on the chosen date of visit (either $10 or $20 depending whether the day you are visiting is peak or non-peak). The Adventure Express charge is on top of your Adventure Cove Waterpark ticket fee. I say this is worth it if you can only visit in midday over a weekend – the queues at Riptide Rocket will be very long and if you are in a rush, get the Adventure Express. Buy your Adventure Cove Waterpark tickets online at www.rwsentosa.com and print the confirmation and E-ticket for quick access into Adventure Cove Waterpark. You will skip the queues of people buying their Adventure Cove Waterpark tickets on the spot. 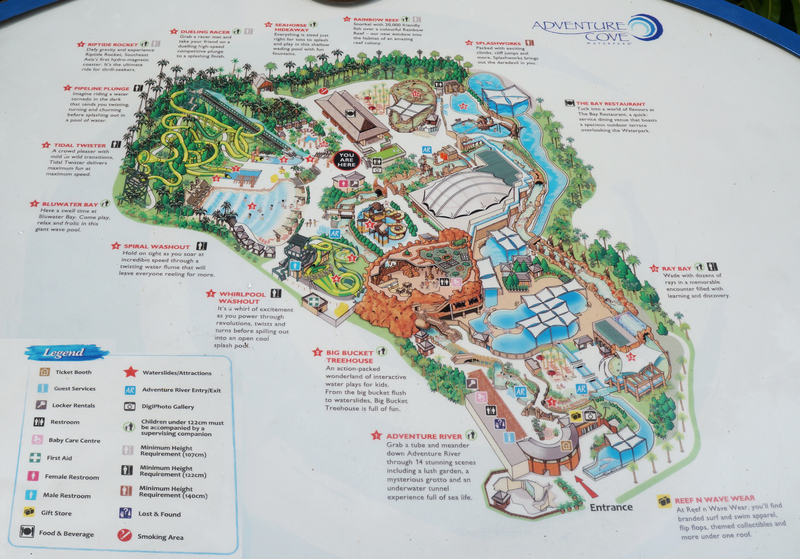 Adventure Cove Waterpark operating hours are from 10am to 6pm daily. Do note the permitted dress code for Resorts World Sentosa Adventure Cove Waterpark. Head towards the Merlion statuette. Walk straight past Candylicious store on the left. Keep left and cross a small bridge to arrive at the Maritime Experiential Museum. Watch a video guide of how to get from Waterfront station to The Maritime Experiential Museum. Follow the signages along the waterfront and you will arrive at Adventure Cove Waterpark. 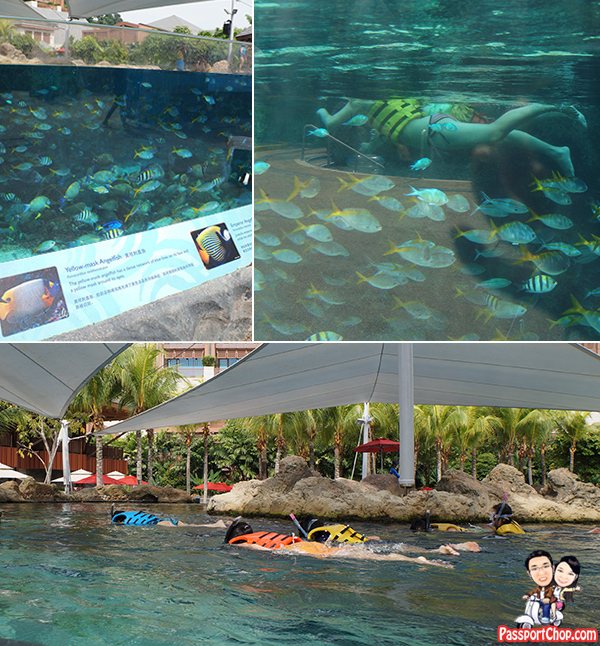 Dolphin Island and Ultimate Marine Encounters are located inside Adventure Cove Waterpark. Enter via The Forum, turn right and walk to the end where McDonald’s is located. Take the escalator up to level 1 and you will see The Maritime Experiential Museum straight ahead across a small bridge. 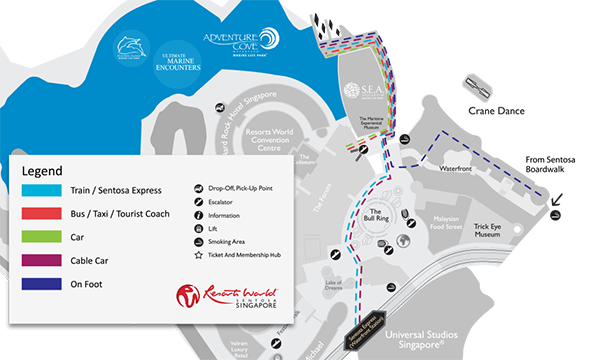 Watch a video guide of how to get from the Resorts World Sentosa drop-off point to The Maritime Experiential Museum. Definitely a great place to spend with the whole family. Do we get swimwear on rent at adventure-cove-waterpark? Are there toilets and showers for changing located everywhere in the resort or only at one area?